Geelong. At Exhibition Theatre today. Edison’s marvellous invention. Five scenes on view. “The Indian War dance”, “The Boxing Cats”, “The Skirt dancer”, “Buffalo Bill”, and “Sandow the Strong Man”. Comment: Alexander Goodall (1874-1901) was a Post and Telegraph Office clerk living in Victoria who died young of tuberculosis. 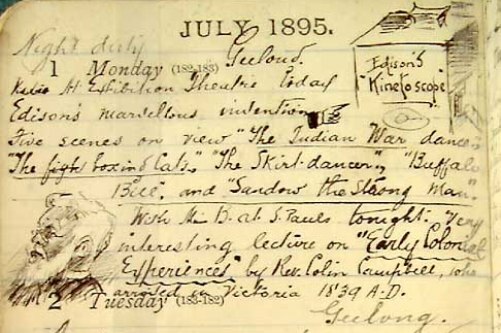 His vividly-illustrated diaries, covering 1892-1897, have been made available online in facsimile form by the State Library of Victoria. This extract records his seeing the Edison Kinetoscope peepshow at Geelong. Other extracts record Goodall’s impressions of the Edison Kinetophone (combing the Kinetoscope and the Phonograph) in July 1896 and the Cinematograph in May 1897. The films referred to are Sioux Ghost Dance (or possibly Buffalo Dance) (1894), The Boxing Cats (1894), Buffalo Bill (1894), Annabelle (1894) and Sandow (1894). This entry was posted in 1890s, Australia, Diaries and tagged Alexander Goodall, Annabelle (1894), Boxing Cats (1894), Buffalo Bill (1894), Peepshows, Sandow (1894), Sioux Ghost Dance (1894). Bookmark the permalink.